Capt. Tom Goodwin stood on the bridge of an oil tanker and looked upon the familiar Bayport Container Terminal. 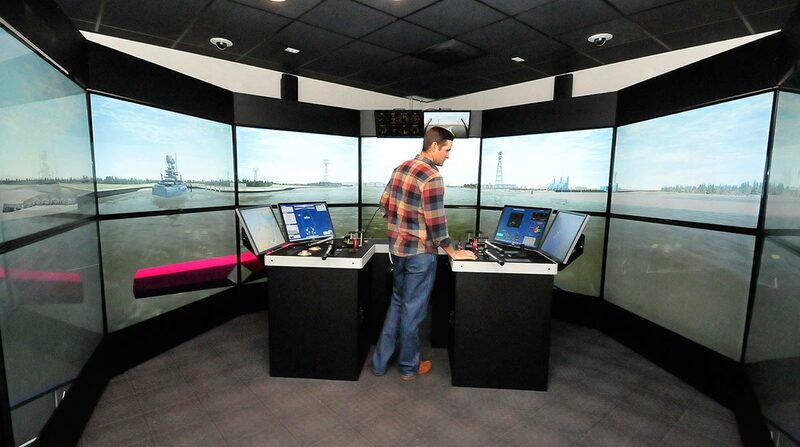 But instead of peering out a vessel’s front windows, he was in a high-tech simulator gazing intently at 13 monitors. The Houston Pilots, tasked with guiding ships in and out of the port, don’t currently allow tankers like the one in the simulation to go down that section of the Houston Ship Channel. It was the first time a pilot was asked to bring any ship that size, 900 feet long and 164 feet wide, through Bayport. The expanded Panama Canal opened just more than a year ago, providing larger passage for ships traveling between Asia and the Gulf Coast. Companies along the Houston Ship Channel have since sought to bring in larger ships. While some of these larger vessels are already in Houston, others are trickling in more slowly. Pilots, Port Houston officials and others continue making the necessary preparations to welcome these behemoths. That’s how Goodwin and two experienced tugboat captains found themselves in simulators Aug. 2 at the San Jacinto College Maritime Technology and Training Center. They were helping an energy company determine if a new dock could accommodate large oil tankers. They were also assessing if it could be done safely. A June 26 news release from the Panama Canal Authority says more than 1,500 “neopanamax” vessels have transited the expanded canal. These vessels are loosely defined as ships too big to fit in the canal’s old locks but not so massive that they won’t fit in the canal’s new locks. The new locks can handle ships carrying up to 14,000 TEUs, a standard industry measurement for a container ship’s capacity that refers to the equivalent of 20-foot containers. The Panama Canal reported a record-sized vessel passed through on May 24 that was capable of carrying 13,926 TEUs. It was roughly 1,200 feet long and 160 feet wide. Overall, 15 of the 29 liner services using the Panama Canal have neopanamax vessels. But most of these shipping companies connect ports in Asia with America’s East Coast ports, according to the Panama Canal’s June news release on the expansion’s one-year anniversary. Larger ships are going to trickle down to the Gulf Coast, said Jim Kruse, director of the Center for Ports and Waterways at the Texas A&M Transportation Institute. Shipping companies will first buy behemoths for specific transoceanic routes between ports with high-volume trade. Then ships that were calling on those ports will be redirected to ports like Houston. These ships will be larger than those currently visiting Houston, but they will never be the world’s biggest ships carrying some 20,000 TEUs. These don’t fit in the Panama Canal and tend to travel between Asia and the U.S. West Coast, where a canal isn’t needed, or between Asia and Europe using the Suez Canal. The largest container ship to call on Port Houston has been capable of carrying 8,200 TEUs, though it did not come through the Panama Canal, said Ricky Kunz, Port Houston’s chief commercial officer. Port Houston recently set a record by lifting 4,198 containers on or off the COSCO Boston at Barbours Cut Container Terminal. The Houston Pilots permit ships that are up to 1,100 feet long and 143 feet wide in certain sections of the channel. Bigger ships will be permitted as various channel improvements are made and the pilots gain more experience with these vessels, Shearon said. Both the pilots and Port Houston are working to accommodate the largest ships that can go through the Panama Canal. Port Houston has spent hundreds of millions of dollars since the early 2000s in preparation. When more of these ships call on Houston, Kunz said, depends on when shipping companies upgrade to larger vessels. But he expects they will come. The Texas population keeps growing, requiring more consumer goods to be imported, and the Port of Houston’s petrochemical boom will ramp up exports. Port Houston owns, operates, manages or leases eight public terminals, including the general cargo terminal at the Turning Basin and the Barbours Cut and Bayport container terminals. It’s also the local sponsor for the Houston Ship Channel, meaning it pays the non-federal cost of the channel, helps maintain dredge placement areas and marshes, and helps coordinate dredging alongside docks in the channel. It recently spent $33.5 million on three cranes that stand 270 feet tall from dock to apex and can unload ships wide enough to carry 22 rows of containers. The cranes departed China on July 23 and began the 2½-month journey to Barbours Cut Container Terminal. Once delivered, Barbours Cut will have seven cranes capable of loading and unloading neopanamax ships. It will also have five older cranes capable of reaching across ships that are 16 containers wide. Bayport Container Terminal has six cranes that can unload ships 18 containers wide, though these cranes can be expanded for ships 22 containers wide. The terminal also has three cranes currently working that can reach across 22 containers, and it will receive three more of the larger cranes next year. Kruse said these types of investments will help the port stay competitive. As ships get larger, they will call on fewer ports due to the amount of time it takes to enter them and the money ships lose while docked. Ports capable of handling the bigger ships quickly and efficiently will be the ones positioned to get the business. “The size of the ships is going to grow, and that’s going to make the competitive nature of the ports even more severe than it was in the past,” he said. Ports are no longer just competing within their geographic region, Kruse said. They’re also competing with ports on other coasts. In the simulator, Capt. Goodwin guided the oil tanker past container ships holding 13,000 TEUs. There was a northwest wind with speeds of 20 knots. While ships often go a little faster to fight windy conditions, the size of this virtual oil tanker and the narrowness of the channel meant Goodwin couldn’t direct the helmsman to go faster. There were just 89 feet between the tanker and the edge of the channel, and 158 feet between the tanker and the container ships it was passing. The simulation proved the tanker could make it past the container ships and to the new dock with those specific conditions and tugboats. Ultimately, Shearon doesn’t expect the ship channel’s current depth to affect shipping companies’ decision to call on Houston. The Houston Ship Channel can accommodate vessels with a 45-foot draft.